It’s an 8.5 x 11 pdf of Valentine’s gift tags/lollipop holders. I created them for my daughter to pass out to her pals in class. 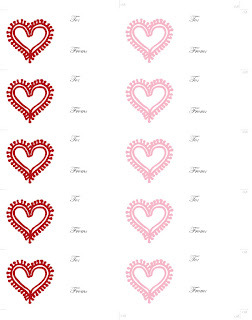 Just print, cut and attach a goodie to each tag and spread the love. Little Cat is is going to punch two holes in the center and “weave” a lollipop stick through them. § 4 Responses to Some Free Love"
What a great idea! The download works for me, I just have to wait until I get home to print it. Thanks for the freebie! You are currently reading Some Free Love at Whisker Graphics.